has lowered risks for extra developments since composability, predictability and dependability issues are tackled by design. The SCALOPES C-board was designed, developed and implemented with the ultimate intention of creating a heavily programmable, low-power networking device. The SCALOPES C-board occupies a standard 1U x 19 inch rack mount case, with active cooling on redundant power supplies, and passive cooling on board. Network interface connectors are mounted on front; management, and mains connectors are on the rear panel. 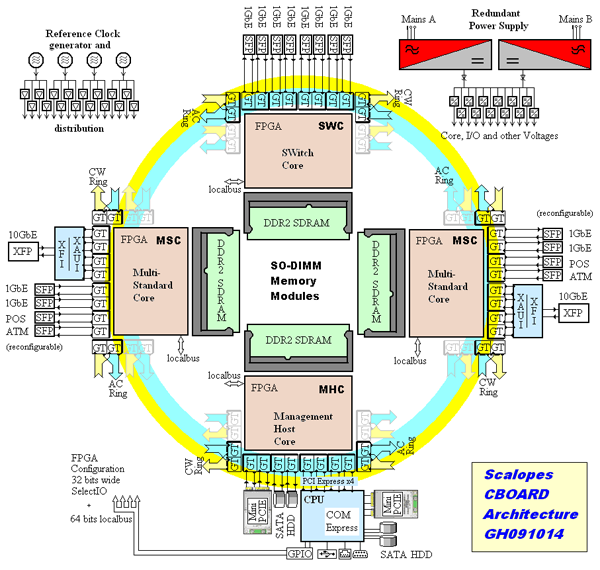 The main part of the hardware is the FPGA ring, containing four FPGAs (Virtex 5, XC5VLX110T). The external interfaces (SFP, XFP and PCI-E slots) connect to the FPGA’s RocketIO ports, which allow high-speed communication between interfaces. Further variation of interfaces (Gigabit fiber, 10/100 Ethernet, STM-1 optic etc…) is possible by using SFP module receivers. 16 SFP module receptacle for 1G/100M/10 Ethernet (half of them are available for Multistandard / Multirate applications). 2 DB9 for RS232 console connection. 1 COM (Computer On Module) Express receptacle. The FPGA-based networking cores are tied onto a Gigabit bi-directional ring, implementing 2x14 Gb/s backplane capacity (ClockWise, and AntiClockwise). This bi-directional ring is made especially visible in the architectural figure. In addition, a TDM local bus is available for handling exceptions, traps, and out-of-band signaling-data, as well as clock synchronization. The physical and logical connection between the interfaces is defined by the FPGA firmware ensuring the hardware’s flexibility. The current firmware is stored on flash memory connected to the chips: they load as soon as the hardware starts. There are four FPGA cores on the board: one Management Host Core (MHC), two Multi-Standard Cores (MSC), and one Switch Core (SWC). The Management Host Core (MHC) can be used to connect the ring to a management PC (COM Express module) for managing the C-BOARD and terminating network services. The Multi-Standard Cores (MSC) can be used as media Gateways and to integrate legacy network links into a modern core network. SDH based TUG/POS/ATM carriers are supported. The Switch Core (SWC) is a generic part of the ring - implementing router functions beyond tagged switching, and MPLS. Each core has a good load of RAM installed as DDR2 SDRAM SODIMM module. Its purpose is application-defined. Switch matrix, flow-CAM, QOS queues can use it. 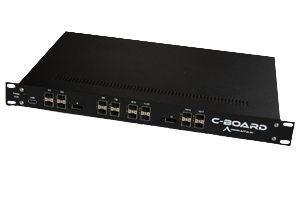 The management computer of the C-board is implemented using COM Express Type-1 (or higher) child board, running Linux operating system.